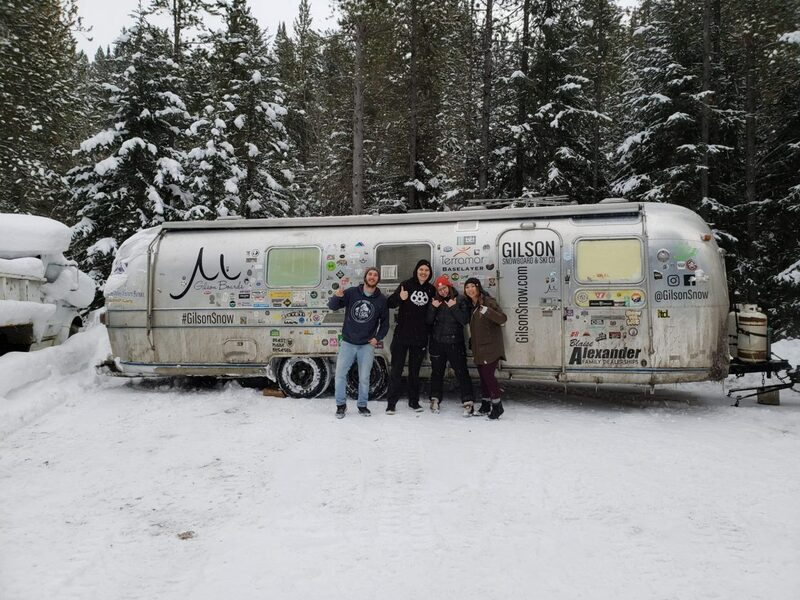 The crew from Gilson Snow poses next to the Airstream they've called home during the past few months. As a 1976 Airstream bounces along behind a truck barreling down a snow-covered highway, a group of riders inside the cab are becoming more and more unnerved by the lack of cell service, no GPS signal, and the 2 feet of snow on the unplowed road. Still, they wouldn’t have it any other way. It was just the latest in a series of escapades for the crew from Gilson Snow as they traveled toward Squaw Valley Alpine Meadows from Washington as part of a nationwide tour to show off the company’s snowboards and skis. The tour, which started the day after Thanksgiving, has taken the group — made up of Spaid, team rider Josh Wortman, Britsh freerider Angelica Sykes, and multimedia developer Chrissy Kim — all over the country to locations like Jackson Hole in Wyoming, to this past week at Squaw Valley. 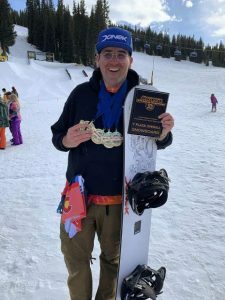 Spaid, who’d previously only worked on the manufacturing side for Gilson, a small snowboard and ski company in Winfield, Pennsylvania, began touring with Wortman in 2017, showing off the company’s patented boards and skis. Each of the company’s snowboards has a soft edge, creating a more surf-like feel to riding the mountain. The Gilson boards’ base curves up to meet the steel, forming a soft edge that allows more drifty maneuvers. “From my experience, it’s the way it handles, how fluid it is transitioning from edge to edge, how playful and relaxed you can be,” said Spaid. The boards also have what Gilson calls central flex, meaning they flex between the rider’s bindings and not much in the tip and tail. Touring across the country in an Airstream loaded with demo boards and skis certainly has its perks, but being on a limited budget and towing a trailer that’s nearly a half-century old to areas that get hit the hardest by winter storms also has its downsides. Wortman added they made a two-hour round trip to pick up electric heaters, only to discover the generator they had couldn’t power them. Things only got worse for the two as they purchased a propane heater and carbon monoxide detector, which continuously went off in the Airstream even when the heater wasn’t running. Several days would go by with Wortman waking up to nose bleeds until the two discovered exhaust from the generator was entering their trailer. That was the low point of the trip for the two, who were later joined by Kim and Sykes. Still, cramming four people into a cramped living quarters with limited amenities isn’t necessarily for everyone. “You throw personal space and alone time out the window. You get to know each other really well. You either thrive or you don’t. We’re all out here for the same reason. We all love the sport, we love what we are doing,” said Spaid. For Sykes, who has competed in past years at Freeride World Qualifier competitions, life in the Airstream was more of an acquired taste. “I’m the high maintenance one and I found it very difficult to acclimatize to that lifestyle because I’m not a ride or die, easy going kind of girl,” said Sykes. The team from Gilson made it through last week’s storm, arriving at Squaw Valley Alpine Meadows from Washington during this past weekend. The highlight of the journey, thus far, they said was being on the first chair at Squaw on Monday for a full day of powder riding and launching off some of the resort’s most well-known features. The crew went on to host a demo day last Saturday at Squaw, allowing the riders and skiers to take a few laps on the company’s patented designs. “It’s very difficult to describe to somebody without testing it out, but you feel the difference and you didn’t realize what you were missing beforehand,” said Sykes. For more information on Gilson snowboards and skis, visit GilsonSnow.com.